For years Russell Cycle Products has depended on outsourcing our foam saddles that we incorporate our Support Suspension System into. With no control over the finished product we were at times sent useless saddles that were to hard, to soft, or inconsistent in density. This led to many problems when it came time to balance foam density with suspension system tension. The marriage of foam and suspension system is complex to achieve the Day-Long comfort we are famous for. 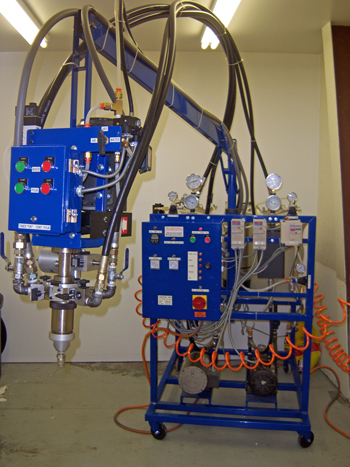 In April 2008 Russell Cycle Products purchased our own Foam processing machine shown in the picture. We named it “The Foaminator”. The unit was custom built for us to meet the need to precisely pour the exact gram weight saddle for each individual Day-Long custom seat. By controlling the gram weight we can in turn control the multiple density’s required for total Day-Long comfort We can now calculate to a higher degree the proper gram density per customers weight factor. The processing has exceeded our expectations and we feel the comfort levels have greatly improved. Here at Russell Cycle products we are constantly working to achieve the ultimate comfort levels. We believe this investment will move us one giant step forward in achieving that goal. As we always say “No two are alike”.